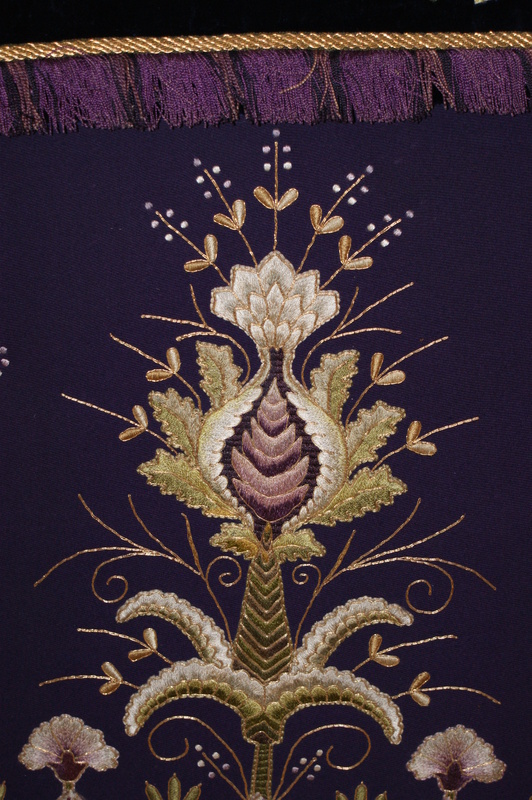 The Leek Embroidery Society was founded in 1879 or 1880 by Thomas and Elizabeth Wardle. Elizabeth Wardle, a renowned needlewoman, was Superintendent of the School and ran the Society, which produced both domestic and ecclesiastical work commercially. Most of the materials used were manufactured, dyed, or printed in Leek, Staffordshire. 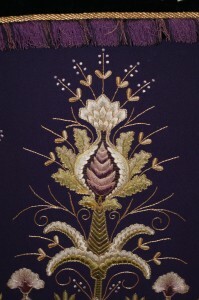 The Society swiftly earned a reputation for fine needlework which was shown in international exhibitions and gained many prestigious honours. 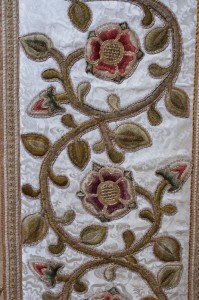 The use of loosely twisted Indian tussur silk in different thicknesses was a distinctive feature of the Society’s work. 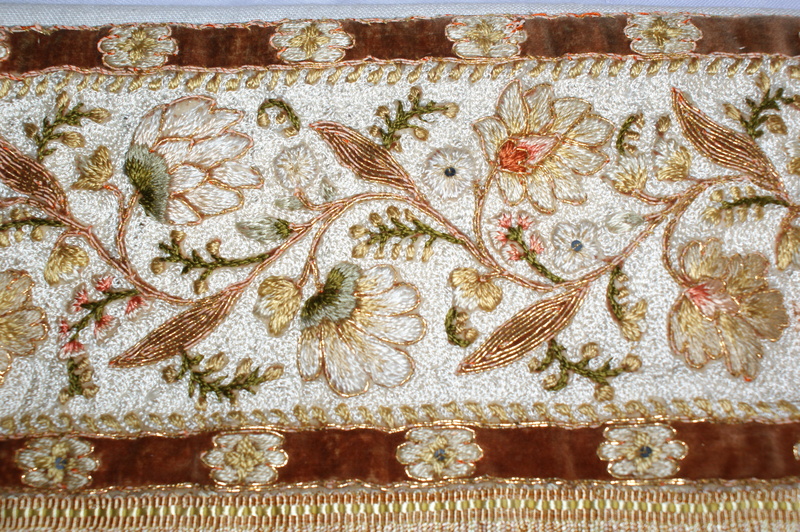 Only a small variety of stitches were used to produce varied textures and shading; many items were embellished with spangles and couched gold thread from China or Japan. Many lavish Leek embroideries for church interiors were produced to commissions by leading Gothic Revival architects, including Scott, Sedding, Shaw and Horsley. They can still be seen in the churches for which they were made. A popular group of patterns used by the society show a distinctive Indian influence. These designs were stitched with Indian silks onto a base fabric of undyed Indian tussur silk, dyed and block printed in Leek by Wardle & Co. The Society had a mail-order business and produced needlework kits that allowed amateur needlewomen access to fine designs and materials. Mrs Wardle was responsible for instigating and organising the production of the extraordinary Bayeux Tapestry replica produced by the Society. 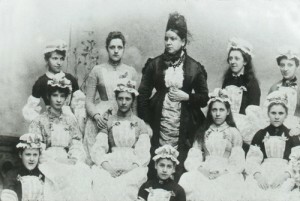 The girls photographed here came from different backgrounds. Two of the girls were daughters of Leek solicitors while others were the daughters of tradesmen, clerks and bookkeepers in Leek. Mary Ann Bishop, one of the pupils, was a relative of Thomas Wardle, her father was Thomas Wardle’s cousin. Besides working on embroidery for sale in the Leek Embroidery Society shop some of the girls worked on altar frontals, exhibition pieces and on the replica of the Bayeux Tapestry. In later years several of these young women did not work for a living but others give their occupations on census returns as embroideress [sic], fancy art needle worker or simply as working for the Leek Embroidery Society. Beatrice Ellen Lowe (Nellie) was the daughter of s successful wine merchant. 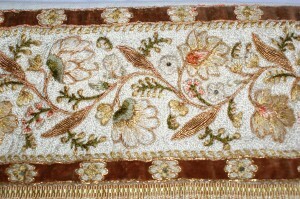 Educated at Westbury-on-Trim she became the secretary of the Embroidery Society.